Manipur Governor and former minority affairs minister Najma Heptulla has been appointed as the chancellor of Jamia Millia Islamia, first woman to hold the top post in the varsity's history. 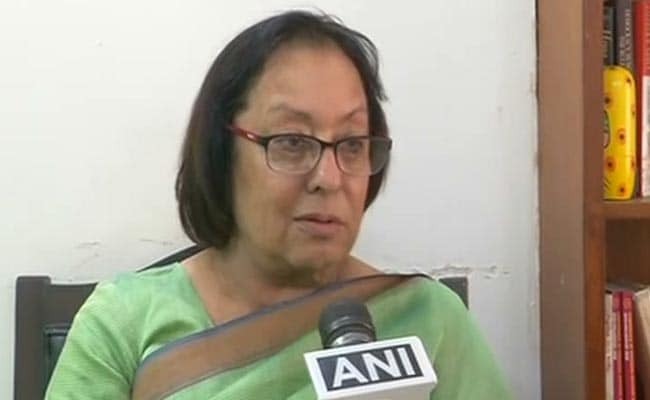 Najma Heptulla succeeds Lt Gen (Retd) MA Zaki at Jamia Millia Islamia. New Delhi: Manipur Governor and former minority affairs minister Najma Heptulla has been appointed as the chancellor of Jamia Millia Islamia, first woman to hold the top post in the varsity's history. Jamia Vice Chancellor Talat Ahmad confirmed the development, saying she has been appointed for a term of five years. The 77-year-old Ms Heptulla succeeds Lt Gen (Retd) MA Zaki who completes his five-year term this month. She is the first woman chancellor of the university since its establishment in 1920. "The university will greatly benefit from her rich experience in both political and public life. It will be our privilege to work with her and to learn from her distinguished career in Parliament and internationally," Mr Ahmed said. Ms Heptulla who has been a five time member of the Rajya Sabha and its deputy chairman for sixteen years served as the minister of minority affairs in Prime Minister Narendra Modi's Cabinet before being appointed as the governor of Manipur. Ms Heptulla has had the distinction of presiding over the women's parliamentarians' group of the Inter-Parliamentary Union in 1993. She was elected President of Inter-Parliamentary Union (IPU), a Geneva-based international organisation from 1999 to 2002, and was nominated by the United Nations Development Programme (UNDP) as its human development ambassador.